A good keyboard is one that offers reliability and responsiveness and all the buttons that you could want. Macro keys are very overrated to some of us and few competitive gamer’s actually find the need for dedicated macro keys. Mechanical keys, on the other hand, while not essential, make a world of a difference. It is one of those things that you don’t know you need till you actually try them. Mechanical keyboards usually come with Cherry MX keys, which are classified as Red, Green, Blue, Black, Brown, etc.., based on various parameters. Backlit keys are a bonus feature but are essential if you are used for gaming in the dark. Paying a premium just for this feature has been a waste though. N Key Roll Over is an important feature to look for in a keyboard, and it’s usually found on mechanical keyboards. NKRO essentially means that all your keyboard inputs will be registered by your PC, even when you press multiple keys simultaneously. 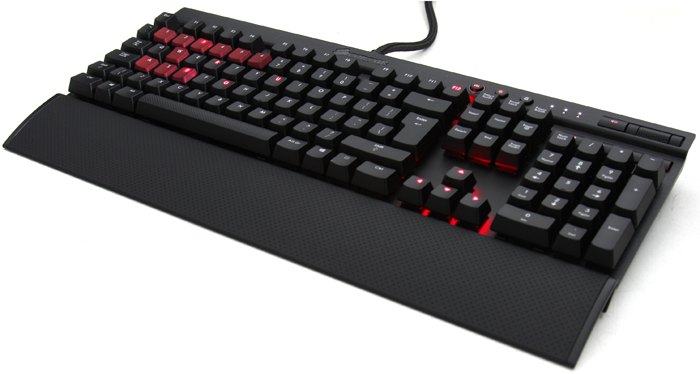 Cheaper keyboards will usually only feature 3 or 5 key rollover, which is alright if you are not a heavy gamer, but in a game like DotA 2 or AoE or LoL, every missed keystroke can cost you badly. Don’t ignore this feature. Tight Budget: Whatever keyboard, you can lay your hands on. On Budget: TVS Gold keyboard. It is ergonomic and has mechanical keys. It costs around 2K Rs. For Mr. Money Bags: Corsair K95 RGB. You don’t need it, but you sure do want it! Price 11K Rs. Don’t forget to check Which Mouse is perfect for Gaming?